I'm a huge fan of competition, but I'm not sure I want to deal with the 3rd party chipset guys again. As the technologies got more sophisticated we started to see serious problems with all of the 3rd party guys (Remember VIA when we got PCIe? 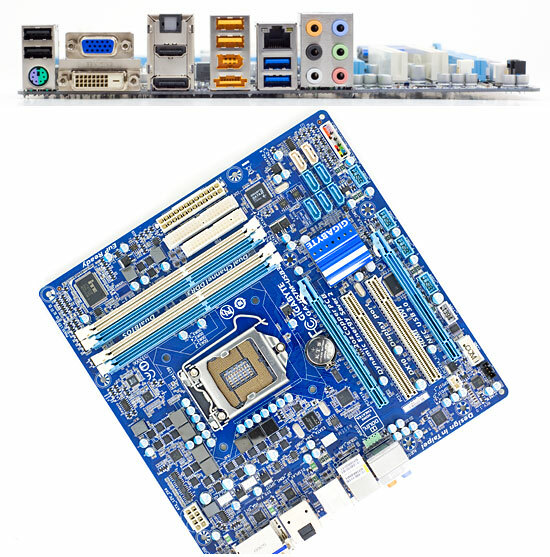 Remember the issues with later nForce chipsets?). 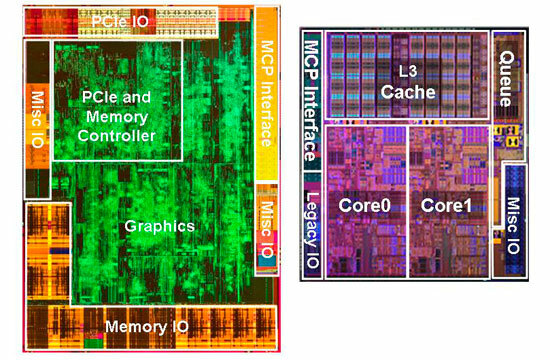 As more features get integrated onto the CPU, the role of competition in the chipset space is less interesting to me. While I'd love to see competition there, I'm not willing to deal with all of the compatibility and reliability nightmares that happened way too often. Also the competition didn't help with the K8-chipset prices. Even though they didn't have to do a memory controller any more, and some registers/logic moved to the CPU. Even if single chip chipsets where possible and available. 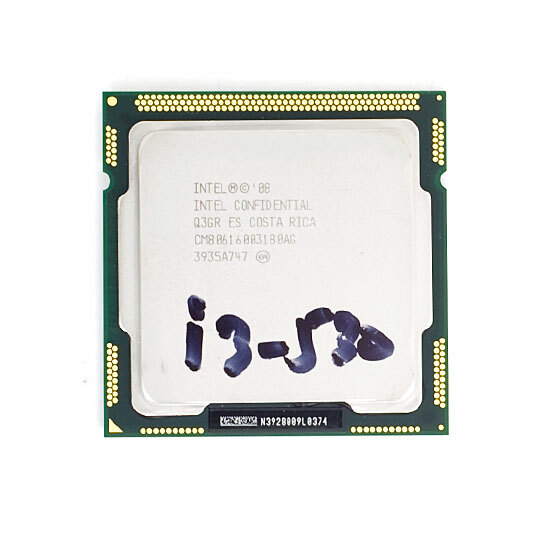 FPS numbers for this Intel IGP is too good to be true. Intel has cheated before with IGP that ddin,t render all polygons and textures to achieve "competite" frames per second numbers. I'm still not convinced by the IGP. Those 661 results are a 900MHz sample vs. the 700MHz HD 3300 on the 790GX board, and the 530 uses a 733MHz IGP. In every single case, the AMD solution wins, be it by a small margin (Dragon Age Origins) or a large one (CoD: MW2) against the 530, but in general, AMD's best is probably about 20-25% better, clock for clock, than Intel's - all depending on title of course. Overclocking the new IGP turns out excellent, however we're still comparing it to a relatively old IGP from AMD. If AMD updates their IGP and bumps up the clock speed, the gap will increase once again. There's nothing to say they can't bring out a 900MHz, 40nm flavour of the 3300 or better now that TSMC have sorted out their production issues. Intel's IGPs are on a 45nm process so AMD may produce something easily superior that doesn't require too much power. However... I'm still waiting. Silverblue, I don't know how it is on the GMA HD, but at least till the GMA 4500, the Intel iGPUs clocked in a similar way like the Nvidia iGPUs. The mentioned clocks are for the shader core. The rest like the ROP and the TMU is likely lower. While for AMD, 700MHz is for EVERYTHING. Plus, the 780/785/790 has more transistors than the GMA HD. The AMD chipset has 230 million transistors while GMA HD package has 170 million. 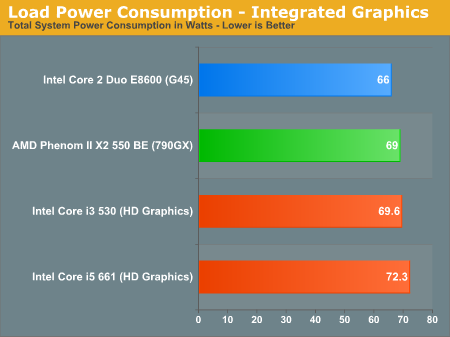 I chose to compare it to the 790GX because that's currently the fastest AMD IGP on the market. I wanted to put AMD's best foot forward. The 785G is literally the same performance as the 780G, the more impressive product name comes from its DirectX 10.1 support. The 890GX is the next IGP from AMD. In our Clarkdale review I mentioned that Intel simply getting close to AMD's IGP performance isn't really good enough. Unfortunately the current roadmaps have the 890GX IGP running at 700MHz, just like the 790GX. The only question I have is whether or not the 890GX has any more shader cores (currently at 8). We'll find out soon enough. Fair enough. But your own tests in the 785 article shows the two being basically identical in performance, the 790 might have some small advantage in certian places (gaming) but if a person wasn't happy with the 785 in that use, I'd put wagers that they wouldn't be happy with the 790 either. At this point, integrated gfx are completely capable for pcs for everything except gaming (and some NLE video editors that use heavy gfx accel for pre-visualizing EFX.) In both those cases, even a $50 dedicated card will far overshadow all the integrated options to the point that I think it isn't right to concentrate on game capability for picking integrated gfx cards. In my opinion, the last area for IGX to compete is video acceleration, which the 785 is at paratiy or beats the 790 there. (Although they both fail without the inclusion of digital TrueHD/DTSHDMA support) but at least the 785 is usually cheaper. In any case, the new i3 really doesn't impress me *just* because it has an integrated gfx on the chip. It seems that the same thing still holds true, namely: If your building a computer for anything other than gaming, you can probably build one where an AMD will result in the same or better performance for less money (TrueHD/DTSHDMA not withstanding.) If you're building one for gaming, you're probably not going to be using the integrated gfx anyway.